Following the gratifyingly large attendance at our February meeting, we felt that a larger room was required, so as you may have read above, we are now meeting in the Small Hall at the Whitehouse. 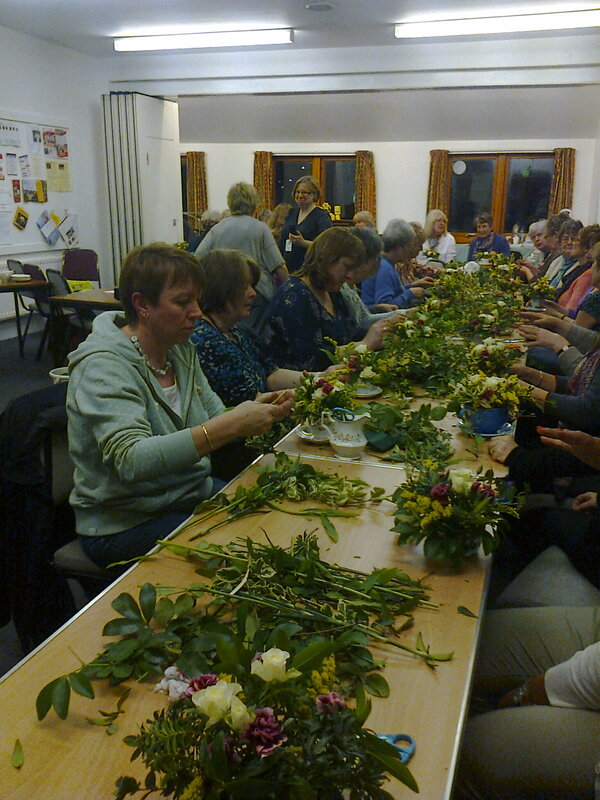 A good job too- as again so many ladies came to the meeting, armed with cups & saucers, to learn from Jeanette Bell how to make gorgeous little flower arrangements in them. How simple it looked when Jeanette showed us the ropes-& how surprised we were to find that-actually-it was! Even for those of us who can destroy a beautiful bouquet in five minutes dead! Now we all have another skill at our fingertips! What a lovely gift to be able to give a friend-or Mum with her special day coming up! Jeanette demonstrated several variations on the theme & as she worked with the flowers told us stories of her international flower arranging exploits, then presented us with the arrangements & more bunches of flowers to add to our raffle prizes for the evening. We had more than the usual number of delighted winners! We would like to thank Jeanette for sharing her expertise with us, Glenys for running the raffle & Pauline for organising the refreshments-where would we be without those two! Each month we ask for a volunteer to provide cake for the refreshments & this month, Jacqui had offered-we would like to thank her as well. So please think about taking a turn-we don’t want the same people to bake for us every time-if we all take a turn it’s easier more friendly. If you don’t want to bake something bought would be fine! Although-well, you know-shh-we don’t want other WIs to find out about that, do we! Previous Previous post: CHANGE OF ROOM AT THE WHITE HOUSE! What an enjoyable evening. My floral display is still looking Great after a week. I will be trying this again at home. Much as I would loved ot take the credit for the Coffee and Walnut cake, I will clarify it was Jacqui Archers baking and not mine.